The Mahindra Thar is quite popular among off-road enthusiasts in India. However, the SUV is even more popular among the modifiers due to Thar’s easy mods. Here are five such Thars from India that look like total beasts! This Thar here gets heavy modifications. Apart from the visual looks, the Thar also gets Code6Tuning performance remap with intercooler from the same brand. To give a boost to the performance, the Thar also gets Code6Tuning exhaust system. There is manual boost controller from Grummspeed, AEM boost gauge that gives an overall boost to the vehicle. The Thar also gets Tein off-road suspension with a 4-inch lift kit, custom off-road bumpers and bull bar. The aftermarket 15-inch wheels and mud terrain tyres now get the support of ARC carbon leaf spring suspension. 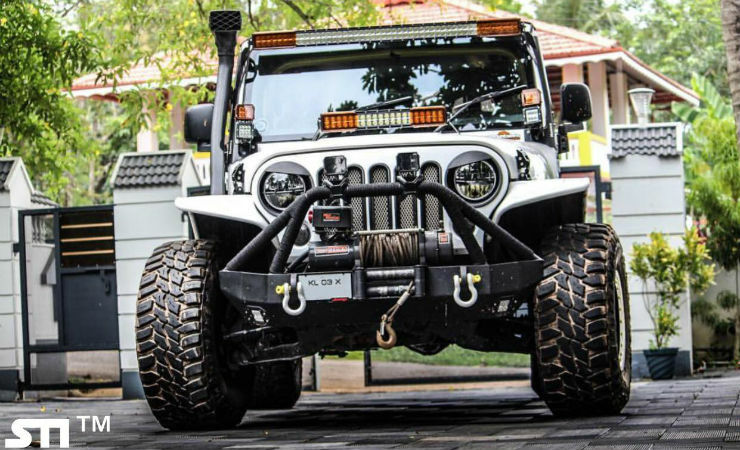 Visually it also gets Rigid Industries LED lights, winch, custom fenders, and R&T front grille. Mahindra does not offer a blue colour as an official colour. This example of Thar gets a royal blue paint job that makes it stand out from the crowd. The Thar rides on Ironman off-road suspension with ARC leaf springs. It also gets a customised hardtop. There are off-road bumpers in both front and rear. There are 15-inch steel rims with 33-inch Maxxis rubber. It also gets custom fenders. 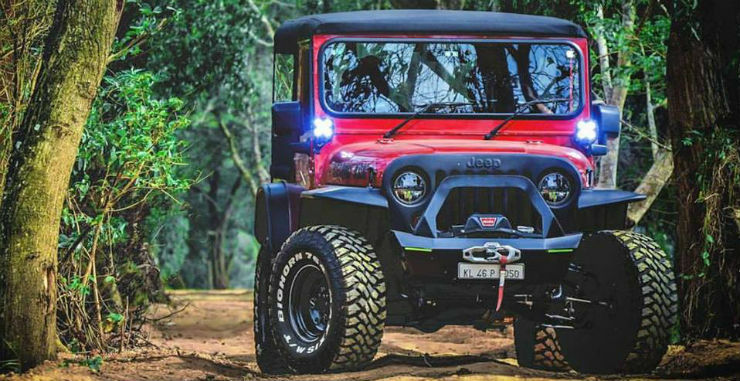 The truly wicked looking Thar gets multiple updates that give it a menacing look. The Thar gets 15-inch off-road spec rims with Mastercraft MT rubber. It also gets an off-road snorkel and a customised roll-cage to save the occupants if the vehicle turtle overs. It also gets custom fenders and flares. There is also off-road spec bumpers and bull bars that truly adds a menacing look. There are two LED bars and small LED auxiliary lamps in front. Also, it gets a high lift jack. The butch looking Thar made by Backyard Customs of Jammu can truly be a head turner on the roads. The Thar gets 35-inch tyres from Mastercraft with a 5-inch custom lift kit. The soft top has been retained but it now gets a roll cage. At the front, there is a custom bullbar and off-road bumper. The headlamps get projector lamps and the grille gets an angry bird cover. The Thar gets light bars on the bullbar, bumper and bonnet while the fog lamps get LED bulbs. The chopped fenders to accommodate larger tyres. On the inside, it gets Sparco bucket seats, power windows, diamond plate flooring, sunroof and a custom audio unit. 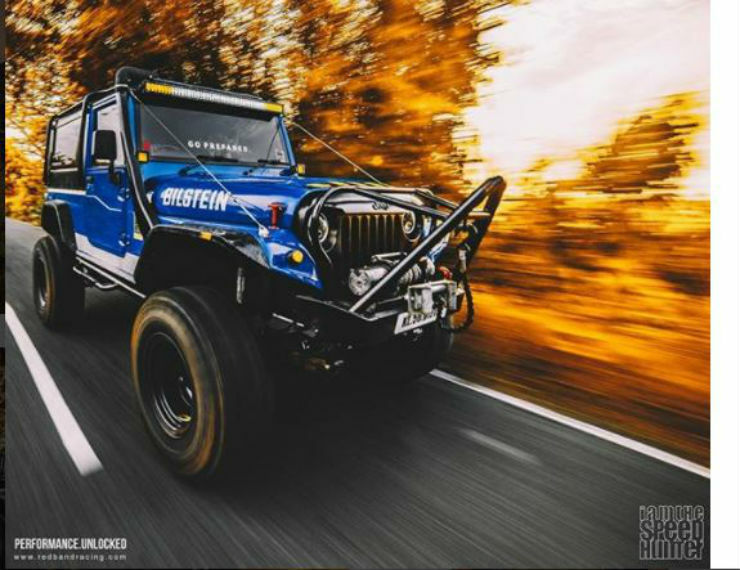 The Thar modified by the Red Band Racing stands out from the crowd because of its unique paint and mod list. It is one of the most powerful Thars in India and has been tuned from Tune-O-Tronics. It produces a maximum of 160 Bhp, which is way higher than the stock 105 Bhp. The suspension has been upgraded to the new Bilstein for better handling. It also gets a roll cage and customised hard top. The Thar also gets 15-inch steel rims with orange paint on the outside. A snorkel has been added for deep water adventures.